Scary Little Girls » News » Locations » “It’s Your Round!” Yorkshire tour! “It’s Your Round!” Yorkshire tour! Book here and book now! Join quiz mistress and pub landlady Pat Pinch as she crams your local with live music, prizes and of course a few drinks. Whether you are a liver bashing barfly or a strict abstainer, a quiz mastermind or an absolute beginner, Pat is waiting to treat you to six of the best quiz rounds across the whole of ‘Up North’. Expect a unique take on the music and picture rounds and see the movie and general knowledge rounds brought to life in a way never seen before. This 70 minute fast-paced experience will celebrate the value of all things local to you. 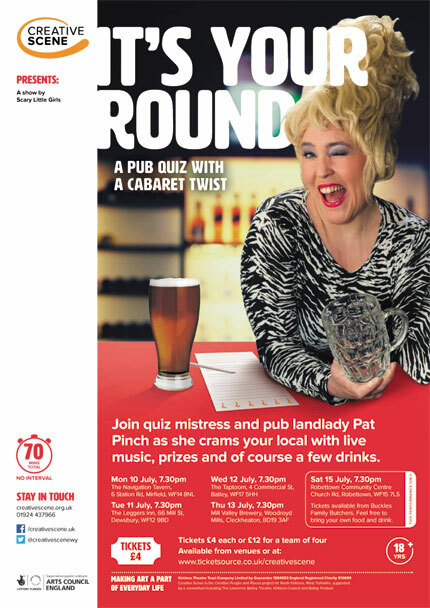 Quiz rounds include putting your local knowledge to the test with Pat’s How Local Are You round; answering questions about the place you live; a live music round plus a beat the barman game with maxi points so everything to play and drink for. May include strong language. For 18+ years.